What is a cacheable item? Create an EP proxy definition to link your Plone site with IIS. Verify that it works. Select one of the Available caching products for plone. Install and enable it. Edit the cache settings for your proxy definition. (See Optimize Cache Settings and Measure Caching Performance ). Caching increases Plone's performance significantly, so most deployments feature a caching solution of some kind. Enfold Proxy (EP) offers a caching solution which is easy to configure and track. They can't handle all requests -- personalized pages and dynamic content require Zope -- but when they can handle a request, they should. Before trying caching, you should review the tutorial about how caching in Enfold Proxy works . This tutorial covers how to view HTTP headers and how to interpret them. Enfold Proxy lets you set up caching for each proxy definition (See Adding a Proxy Definition). Each proxy definition will store the files for caching in a separate directory (typically C:\Program Files\Enfold Proxy\cache). Except for object-based caching or XSLT caching , you can configure caching almost entirely through EP's configuration utility without needing to edit the eep.ini file. If you configure your proxy definitions manually, the cache settings will be set directly in the [host] section corresponding to the individual proxy definition. All cache-related configuration options are prefixed with cache_ . This table of caching options contains a description of each option which you can configure through EP's configuration utility. First, let's cover the kind of web items that can and should be cached. content for anonymous users. Items (such as Plone-generated HTML) can be cached with little danger. selected content for logged in users. Warning Incorrect configuration of caching has the potential for authenticated requests being cached (which is bad). Generally, the two Plone products discussed below have sensible policies about not caching authenticated requests. Nonetheless, if you are creating a customized CacheFu policy or using another caching product for Plone, it's a good idea to confirm that authenticated requests are not being cached. Before you can cache, you must install and activate a product in Plone specifically for caching. 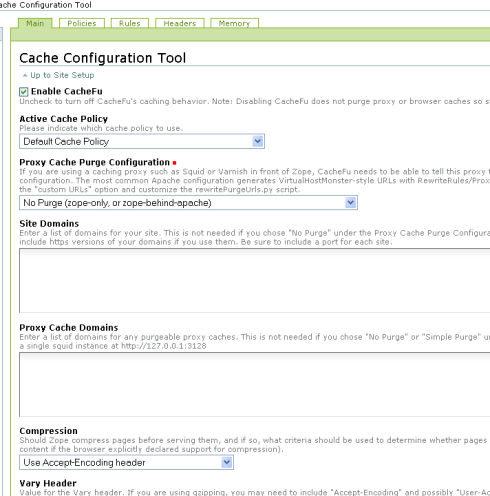 With this product you can configure and customize cache settings. (these are generic instructions for installing any Plone product). Choose which caching product you wish to use (see below). If necessary, download the product and place inside the Products directory of Plone/Enfold Server(typically C:\Program Files\Enfold Server\Products in Windows). Go to the Plone control panel (i.e., http://www.originalfunsite.com/plone_control_panel) and select Add/Remove Products. You should see the name of your Product(s) on the Products available for install list. In the Plone control panel, look for a link under Add-on Product Configuration. One of these links should lead you to a configuration menu for the caching product you have chosen to install. From the product configuration options, make sure caching has been enabled/turned on. Chasseur is a Plone product included with Enfold Server. It was designed for ease-of-use and simplicity. It is currently maintained and supported by Enfold. 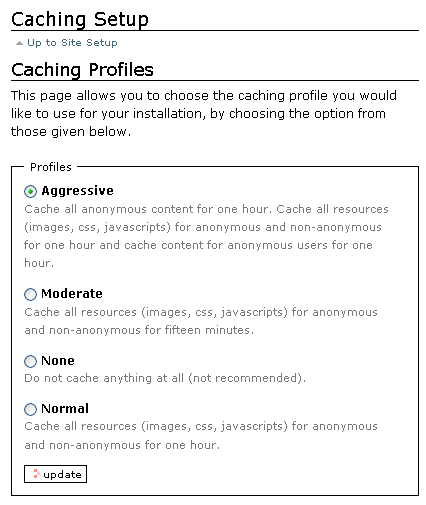 The main two settings are Normal (cache images, js, css for one hour) and Aggressive (cache js, css, images for one hour and also cache content for anonymous users for 1 hour). Normal is generally risk-free and unlikely to cause problems, especially if image files are unlikely to change. Aggressive is generally not recommended because it interferes with EP's ability to purge content. When that happens, an individual browser might use private cache instead of checking with EP/ES to make sure it has fresh content. (See Purging Content with Scripts). CacheFu is an open source product with a wide variety of features. Actually, it consists of 4 separate products (CacheSetup, PageCacheManager, CMFSquidTool, and PolicyHTTPCacheManager) which are dropped into the Products directory. CacheFu offers a lot more granular control over caching. It lets you set policies and configure headings and cache rules for different content types in Plone. Important: you need to enable a caching policy for CacheFu to work in EP. On the first tab, you need to choose Enable CacheFu. Under Active Cache Policy, choose Default Cache Policy or choose another policy (You can create one from scratch or clone an existing one by going to the Policy tab). On the first tab, you will also need to choose a Proxy Cache Purge Configuration; choose No Purge (zope-only, or zope behind apache). CacheFu will use cache headers different from Chasseur. But EP is able to process both of them; in fact, after you enable CacheFu, Chasseur will deactivate all cache profile previously enabled. You can specify caching behavior in Plone by deciding which header to use when returning a particular Plone content type. To do that, go to the Rule tab, and select the content type you want. Each rule will let you specify a header for anonymous users and a rule for authenticated users. (Presumably, you'd want a reduced amount of caching for authenticated users). The label for each header ("Do not Cache", "Cache in proxy-cache for 1 hour," "Cache-in-browser for 1 hour," etc) should be self-explanatory. Keep in mind that you can also edit properties for each header on the Headers tab. at the time of this writing (January, 2009), a browser bug in Internet Explorer prevents sysadmin users from viewing/editing properties on the CachuFu Rules tab. (This bug does not affect users of Firefox). CMFSquidTool is an open-source caching product supported by Enfold which lets you purge cache. (As long as you set your IP address in Caching Purge Sources -- see Purging Cache). However, you may find it easier to use Enfold Proxy to purge cached items for proxy definition(s). Plone will reply, "Nope. That's an outdated version." (In this case, Enfold Server or Plone will send the updated version to Enfold Proxy, which will pass it on to the browser and also replace the outdated version with the newer version). X-Cache: MISS from www.originalfunsite.com . If you see X-Cache: HIT, then yes, caching is occurring. If you see X-Cache: MISS, then this particular item was NOT cached. Select your proxy definition. Select the Caching tab. Leave this blank if you want your cache directory to exist under the application directory. The directory will be created if it does not exist. If you wish to put your cache files elsewhere, you should copy the complete path to the directory here (e.g., C:\My Documents\proxy definition 1\cache). Important: IIS must be restarted before a change to this option will take effect. Move the cache directory into a new location. Copy the absolute path into the Cache Directory field of your proxy definition. Press the Save button. After you press Save, Enfold Proxy will make the cache directory writable by the user running Enfold Proxy. For normal operation, the Enfold Proxy process requires access to the logs and cache directories. The Network Service account under IIS6 does not have this permission. Even if Enfold Proxy has no access to these directories it will still run as a proxy - although no logging information will be written, and it will not operate as a cache. The Enfold Proxy configuration tool attempts to ensure the directory permissions are set appropriately, but depending on local policies, this may not be effective. It may be necessary to manually configure the IIS application pool or the permissions on the directories to enable these facilities.